And it’s the first day of summer! I am, of course, looking forward to the summer ahead of me with nervous anticipation. But it’s been hard saying goodbye to my friends as the knowledge that I am about to begin my last year alongside them slowly creeps up on me. And that’s why my birthday dinner this year meant more to me than it has in the past—it served as a year-end celebration, a party not just for me but for all of us as we made our way out of what was (hopefully) one of the most stressful years we’ve faced so far. For this year’s birthday celebration I chose to veer away from the multi-layer multi-day cake thing that has been my go-to for the past couple of birthday get-togethers. I love making layer cakes—the planning and the decorating encompass some of what I love most about baking. But that very planning and baking that I appreciate and enjoy so much can also be stressful, time-consuming and complicated. And so I opted for a much simpler, more homey and more me dessert that has been a favorite of mine since before I can remember. 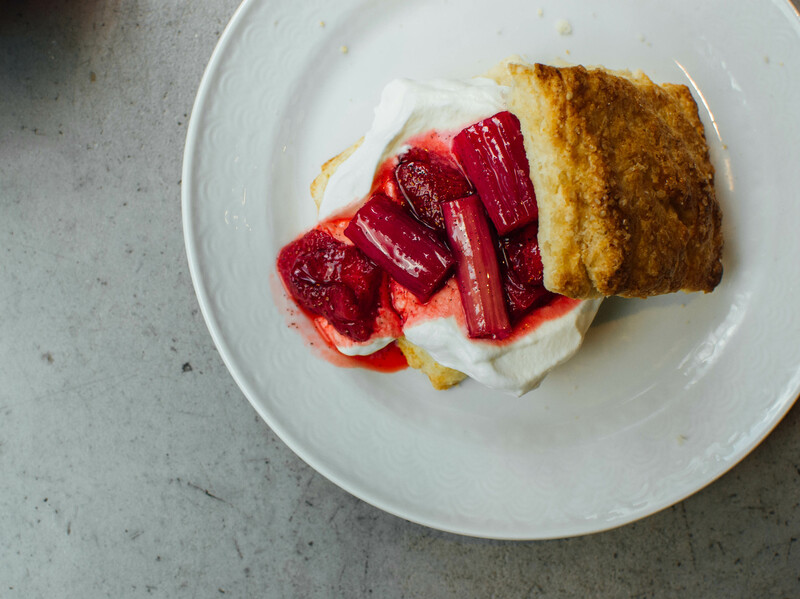 In my opinion, it is this dessert and this dessert alone that seems somehow capable of taking summer in its essence and sandwiching it between two buttery, flaky biscuits. 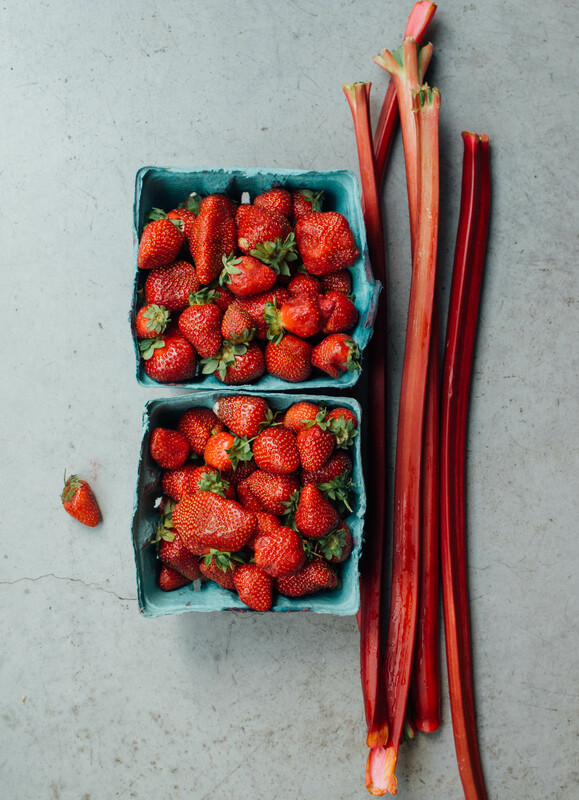 Rather than go the traditional raw strawberry route, I turned to my new favorite technique and roasted fresh berries and rhubarb with vanilla bean and sugar. 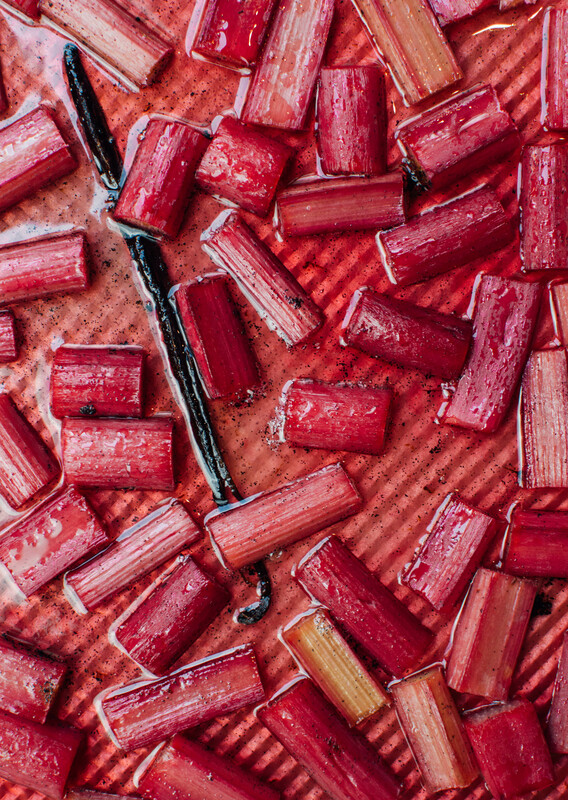 This roasting brings out the most wonderful flavor while preserving the gorgeous color and integrity of the fruit, allowing the produce to assume it’s role as the star of this dessert. This dish is the perfect summer party addition—throw the sheet pan of biscuits on a counter with a bowl of fruit and softly whipped cream and your work is done. You can use any fruit you’d like here, but I was lucky enough to find these beautiful berries and stalks of rhubarb at my farmer’s market in early June. 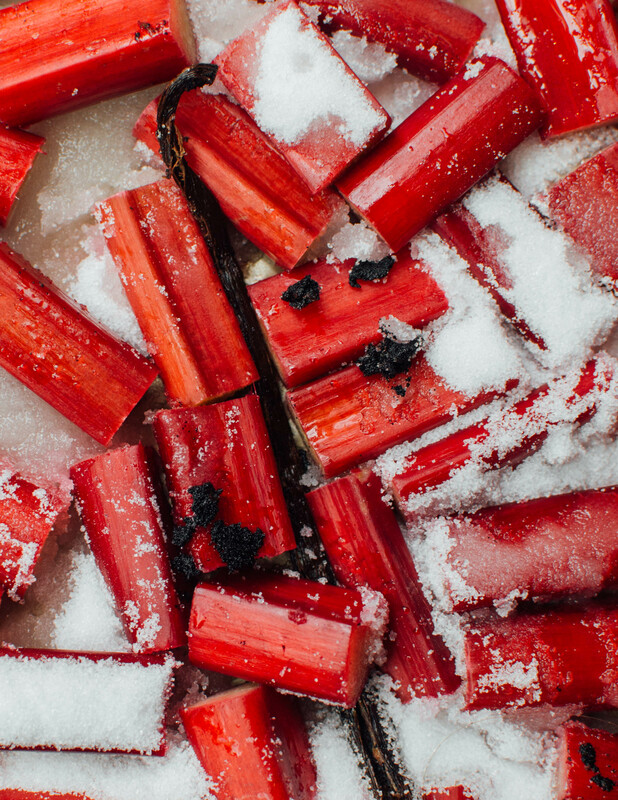 Start with the rhubarb: Heat the oven to 375 F. Slice the rhubarb into 2-3 inch lengths. Stir it together with the sugar , lemon juice and vanilla bean seeds, then transfer to a baking dish and add the scraped vanilla bean. Roast until soft and juicy but not falling apart, about 15-20 minutes. 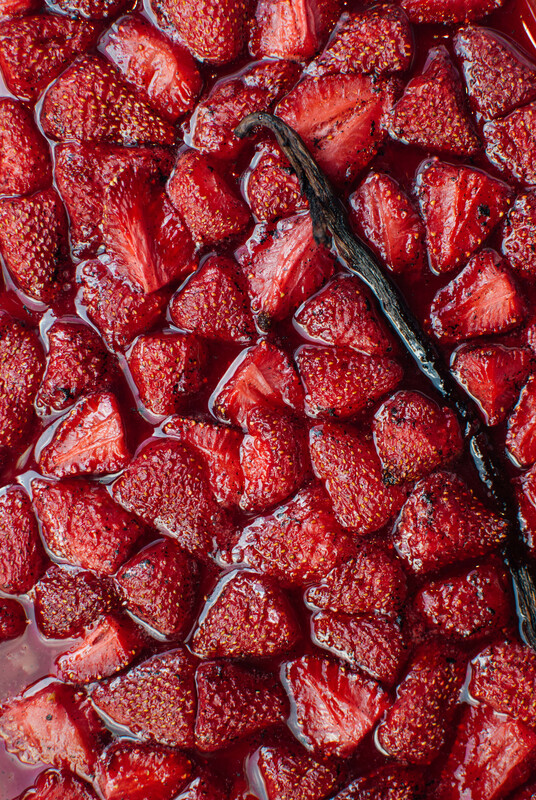 Next roast the strawberries: Heat the oven to 425 F. Place the strawberries, sugar, salt and vanilla bean seeds in a baking dish and toss to combine. Add in the vanilla bean pod and roast, stirring occasionally, for 15-18 minutes. For the shortcakes: Heat the oven to 425 F. Line a baking sheet with parchment or a Silpat. Whisk together the flour, granulated sugar, baking powder and salt. Add the cubed butter and use a pastry blender to combine until the mixture resembles coarse crumbs. Pour in the buttermilk and stir until the dough starts to come together. Turn the dough onto a work surface and knead it gently together into a ball. Flatten into a 1/2 inch thick rectangle and cut into 16 squares (you can also use a circle cutter for this). 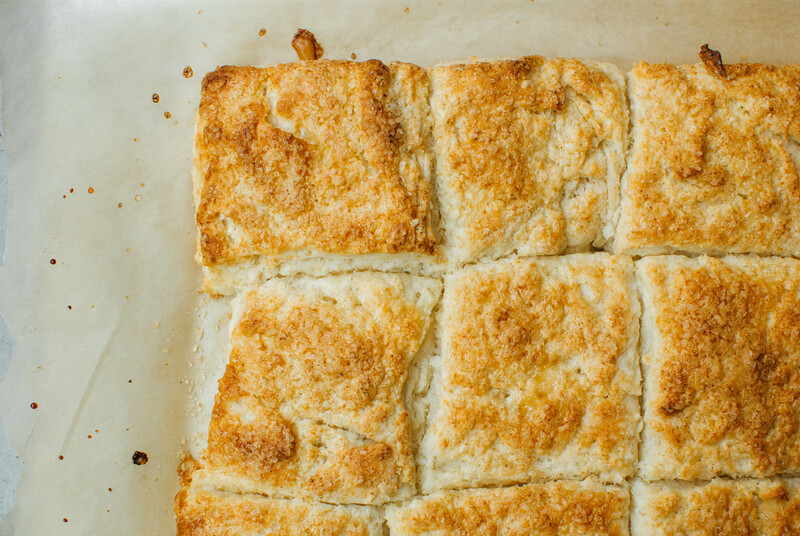 Place the biscuits on the prepared baking sheet so that their edges touch and brush the tops with heavy cream. Sprinkle with turbinado sugar and bake for 15-20 minutes, or until golden. Cool on a wire rack. To assemble: Whip the cream to soft peaks in a stand mixer and add sugar and vanilla to taste. 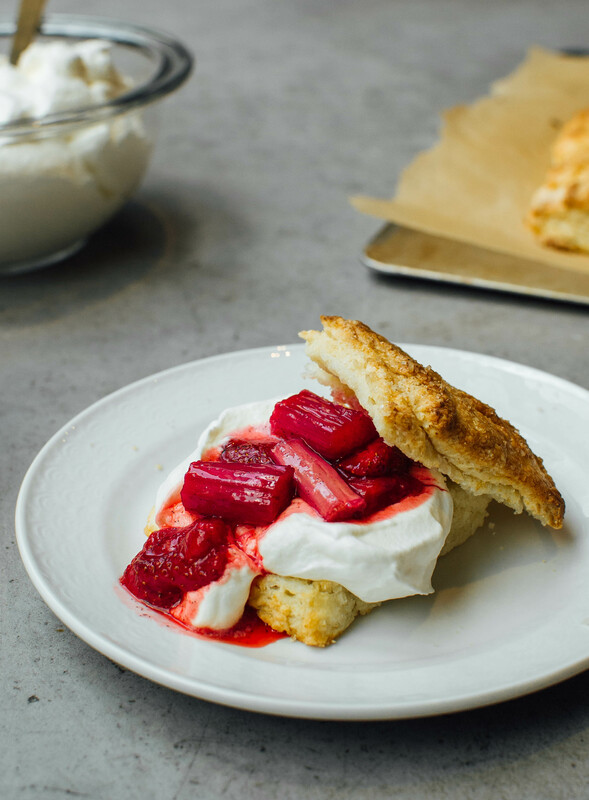 Split open the shortcakes, dollop on whipped cream and spoon on roasted fruit. I think this is the best shortcake recipe I’ve ever tried. Light and buttery and not too cakey. Absolutely delicious. Amazing! And so beautiful. 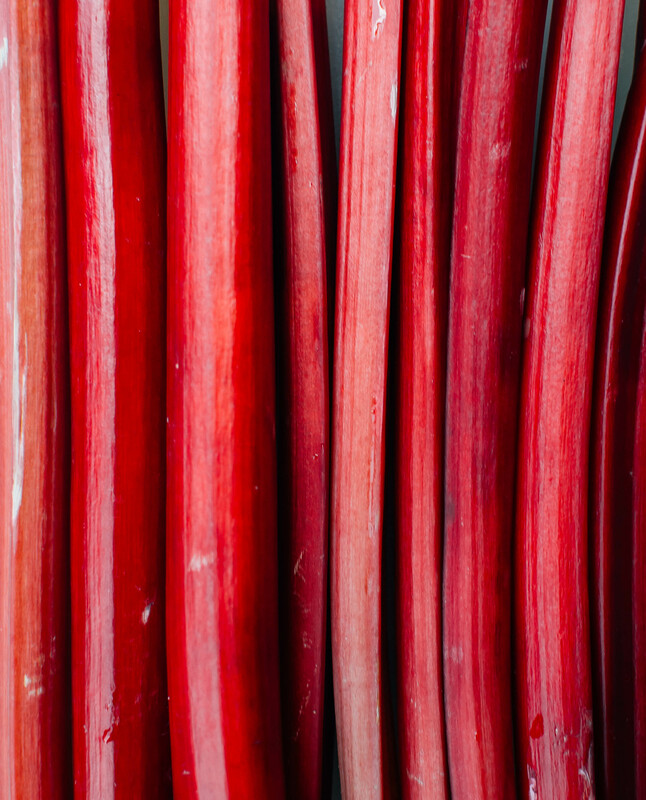 I love the red colors and love the roasting of strawberries and rhubarb with vanilla bean. Tangily wonderful and sweet and vanilla-ish!